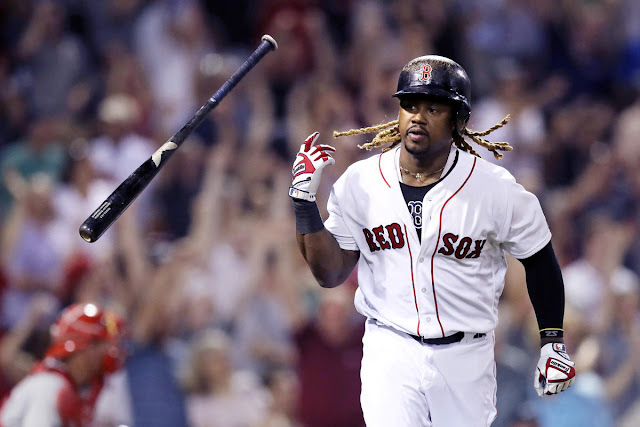 After two wins over the Boston Red Sox on Friday and Saturday, the Yankees looked to sweep the Red Sox on Sunday, but knuckleballer Steven Wright shut the Yankees offense down. 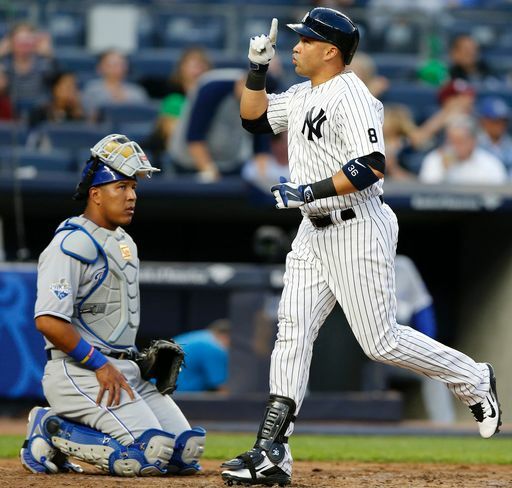 Today, the Yankees started a 4-game series against the Kansas City Royals at home. 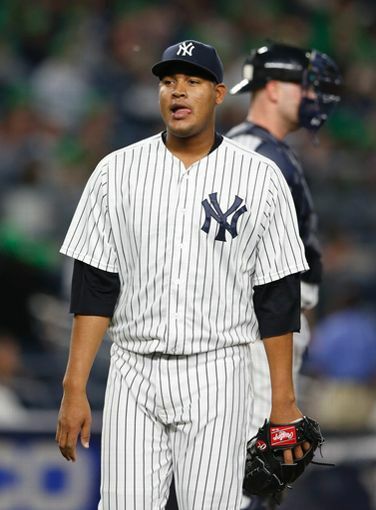 Ivan Nova (1-1, 5.14 ERA), replacing CC Sabathia in the rotation while he’s on the 15-day disabled list, faced off against Kansas City’s Chris Young (1-4, 5.76 ERA), who is the most extreme fly ball pitcher in MLB (and has been since 2002). 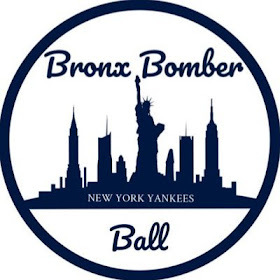 Chien-Ming Wang also made his return to the Bronx for the first time since July 4, 2009. He was a 19 game winner for the Yankees in both 2006 and 2007. Aroldis Chapman also returned to the Yankees active roster after serving his suspension. 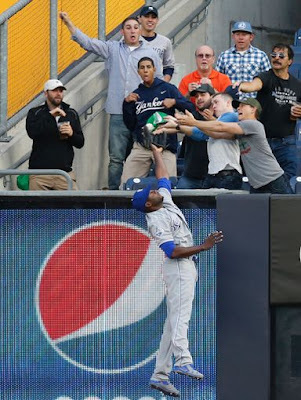 After Cheslor Cuthbert singled to start the inning, Jarrod Dyson grounded into a fielder's choice. Dyson then stole second, and then Alcides Escobar grounded to first, but Nova missed the bag with his foot after catching the throw from Teixeira, so everyone was safe. Nova struck out Lorenzo Cain for the second out, but he already went past 75 pitches, so Phil Coke came in. 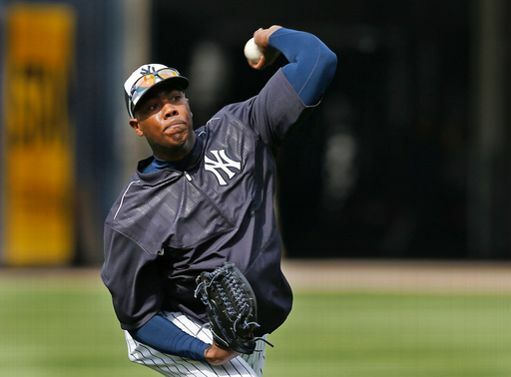 Aroldis Chapman entered to make his Yankees debut in a regular season game. 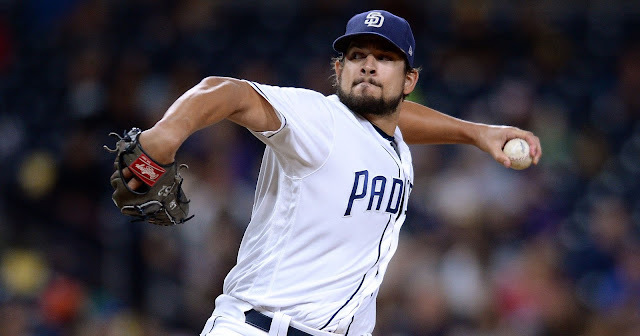 He struck out Omar Infante, his first batter with a 97 MPH fastball. He then struck out Cheslor Cuthbert with a 101 MPH fastball. Yankee Stadium was getting very loud at this point. 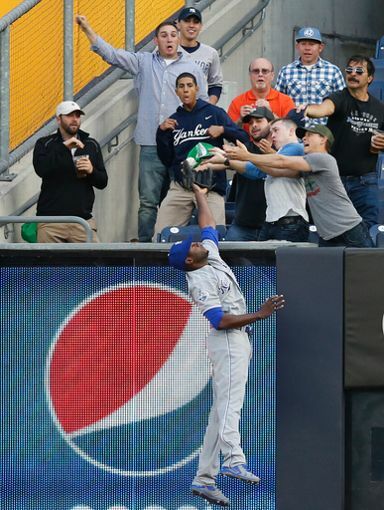 The Royals cut the lead to 6-3 with a Paulo Orlando double, followed by a Alcides Escobar single. However, Lorenzo Cain grounded out and Chapman completed his first inning as a Yankee and the Yankees won, 6-3!